Tour of Stockport Air Raid Shelters Friday 10th May at 2 p.m.
Demand has been so great that an extra tour has been organised to run simultaneously, but in the opposite direction. Consequently there are places again available. Age 65 and over £5.75 pp. 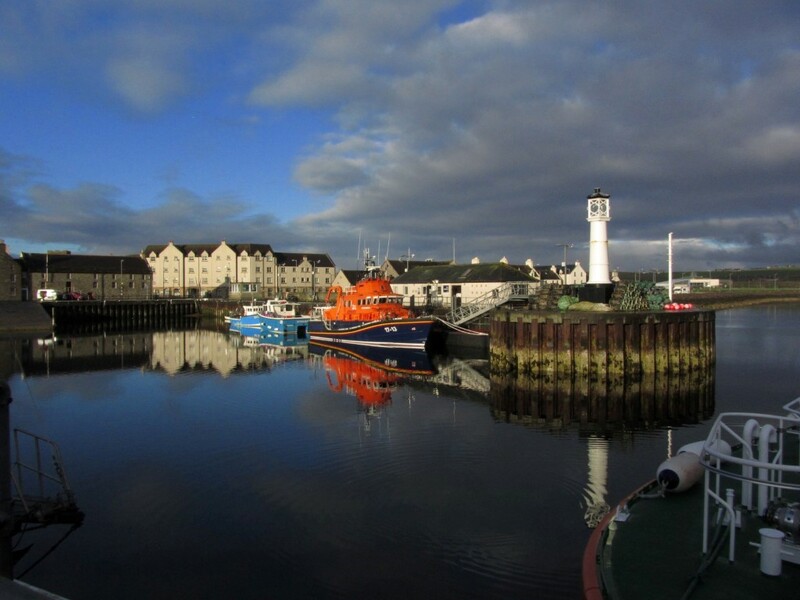 Slipping out of Kirkwall Harbour early in the morning en route to the Island of Eday. Poring over maps as I so often do, I conjure up a ‘3 D’ picture in my mind of a certain area and one such area had long been the northern tip of the island of Eday in the Orkney Islands. A prow of land shaped like the bow of a ship culminating at the trig point at Red Head. I have long been intrigued by this location and promise myself that it was high on my visit list. 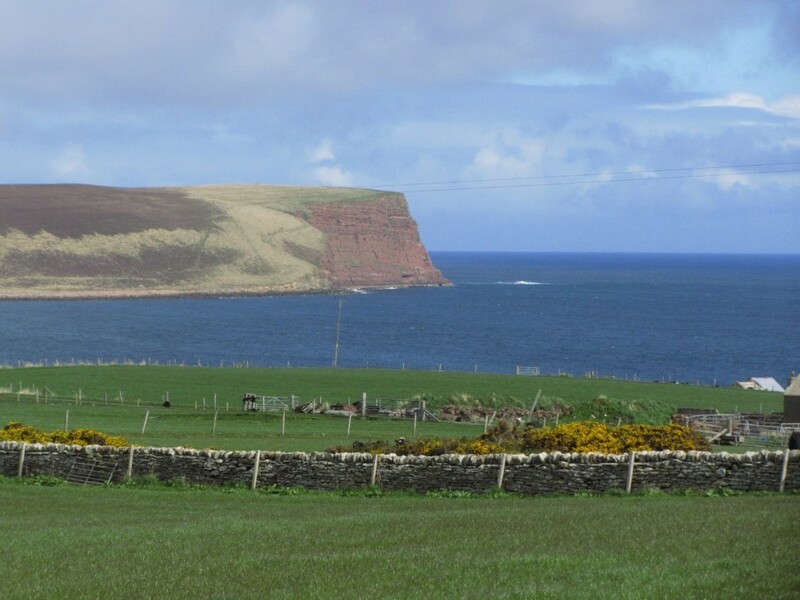 Eday is just ten square miles and has a population of around 130 inhabitants and is the ninth largest island in the Orkney archipelago. 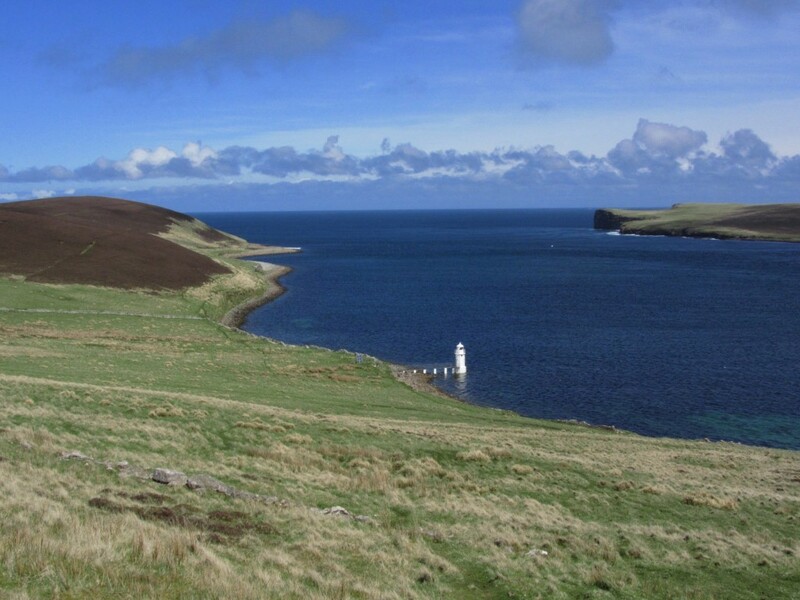 The island lies around fifteen miles north of the Orkney capital Kirkwall. A distant view towards Red Head at the northern tip of Eday. Planning a day trip to Eday with my son Stewart back in 2013 during a week long trip to the Orkney Islands meant we were restricted to Wednesday due to the ferry timetable and so I was banking on good weather. My initial plan was not to take the car to the island but with the weather being somewhat doubtful and the island having little if any shelter, it was worth spending the extra few pounds to make a day of it and if needed have the shelter of a car if the weather took a turn for the worse. The ferry meant an early start as we had to be in Kirkwall by 06.30am for the rather long trip via the island of Stronsay. It was after 9am by the time we were disembarking on Eday and then in a rain squall. We drove north up the island spine road, the empty B9063. This was an area that even Google street level mapping hadn’t reached! Our main aim was to get a good walk in but parking proved a problem as most lane endings finished at a farm entrance. In the end we found a small car park at the bird hide by Mill Loch. It was time for our morning break as another rain squall moved through but the weather looked good after that. The Ranger for the island turned up and we chatted awhile. She was surprised to see ‘tourists’ as she estimated that we were about the eighth tourist this year. Stephens Gate, a natural arch on the eastern side of Eday was passed early in our walk. Stewart and I set off on our walk along the lane towards the hamlet of Hammerhill to visit the island shop. I am always interested to see how well stocked these places are and the variety of goods on the shelves. As well as the range of foods these shops are like mini department stores. It was now for some serious walking as we took the track behind the hamlet towards the coast. The track degenerated into a path which later disappeared altogether but at least wooden marker post kept us on the correct route. Turning north we followed the coast passing Stephens Gate, a natural arch on the low cliffs. Further on we passed a couple of sea stacks called The Castles where a stout barbwire fence separated us from the cliff edge and so views were limited. We had to turn away from the coast here before a right turn along a grassy track to the deserted B9063. A left and right turn took us along another lane via Carrick Farm to the historic Carrick House. 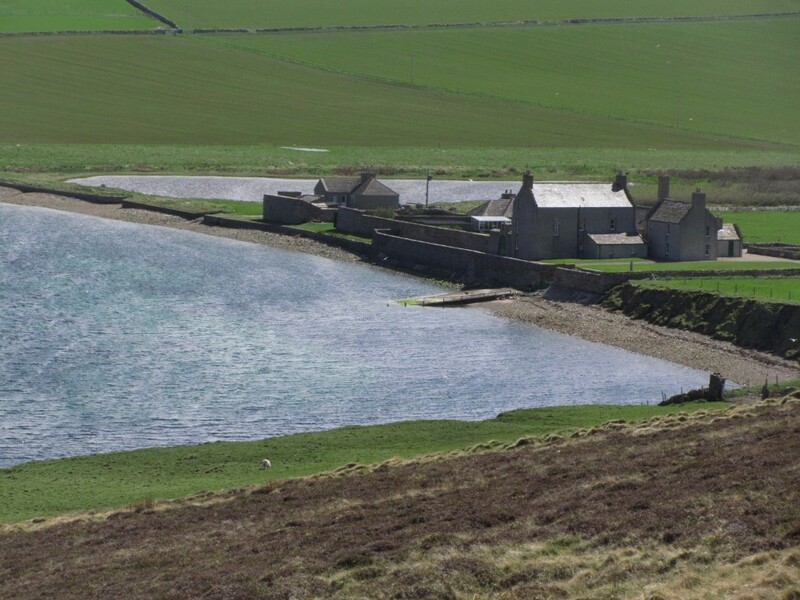 This was the location where John Gow, the notorious Orkney Pirate luck ran out. His life started as a deck hand on one of the many ships which plied out of Stromness but on one trip, and with bad feelings running high, he and others mutinied and killed the captain and other senior officers before renaming the ship ‘Revenge’ and carrying out piracy on the high seas and so Orkney has its own ‘Mutiny on the Bounty’ story. John Gow took his pickings by raiding prosperous houses on the coast but came unstuck when he chose to take the rich pickings form Carrick House in 1725. His ship ran aground and he was overpowered by staff and islanders. His fate was that he was tried in London for his crimes and along with other accomplishes was hanged. Today Carrick House overlooks Calf Sound in much more peaceful times. Carrick House overlooks Calf Sound and the location where the notorious pirate John Gow’s luck finally ran out. The Calf Sound Lighthouse towards the northern end of Eday set on the edge of a aquamarine sea. Heading north, Stewart and I now followed the shore with a brief stop at the Calf of Eday Lighthouse. The path ahead petered out and so we made our way uphill to follow a better path along the ridge to the trig point at Red Head. Despite its modest 70 metres above sea level, the headland afforded far views to the islands of Westray, Sanday and North Ronaldsay set in a aquamarine sea. Thankfully we had picked a perfect day and we were being blessed with sunshine. The headland as such was surrounded with a new and stout barb wire fence and not easy to cross, but I ventured out to the headland not that you could see much of the sandstone cliffs. Red Head at the northern end of Eday. It may be only 70 metres above sea level but the views on this day were magnificent. Setting off once more we followed the coast south westwards before turning towards Vinquoy Hill by which time it was turning into a really fine sunny afternoon. As we followed the hillside along to the summit of Vinquoy Hill the views across Calf Sound were spectacular and we could hardly believe our luck to get such good weather. Along the ridge of Vinquoy Hill we came to Vinquoy Chambered Cairn. 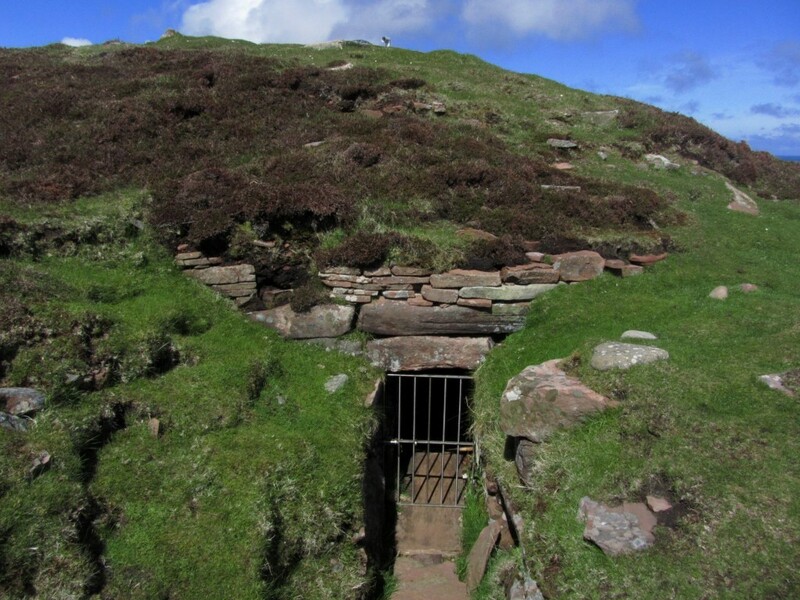 We could crawl inside to the main chamber of this perfectly preserved chambered cairn. 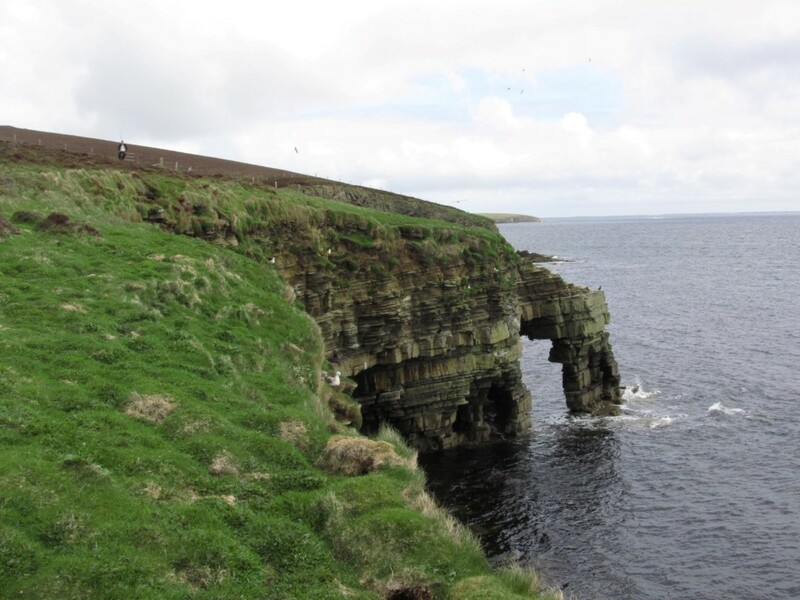 A short walk took us downhill across one or two areas of boggier ground but thankfully with board walks to reach the Stone of Setter, Orkney’s tallest standing stone at 4.5 metres. Finally it was back along the road to the car then to spend the rest of the day exploring the rest of the island including a shorter walk around War Ness at the southern end of the island and up to Ward Hill, which at a modest 101 metres is the highest point on the island. Vinquoy Hill Chambered Cairn which you can crawl into. 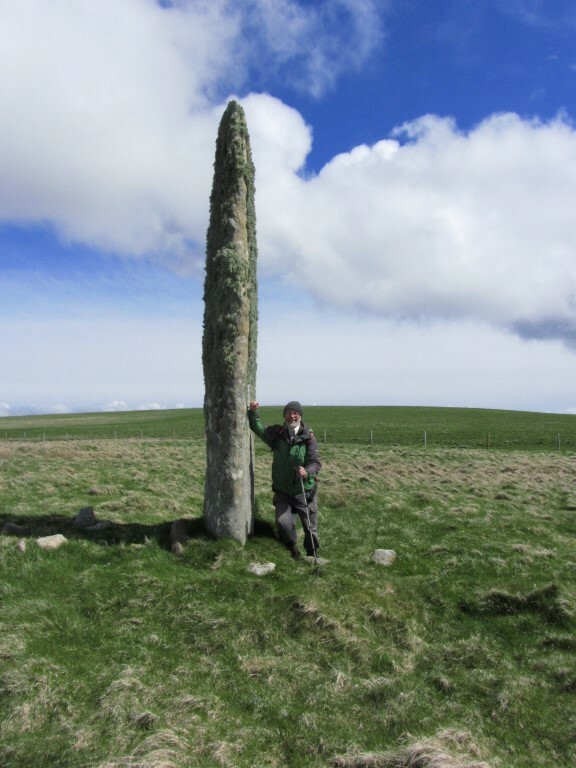 The Setter Stone which at 4.5 metres tall is the highest standing stone on the Orkney Islands. Heading back down the spine of the island there was another place worthy of a visit. 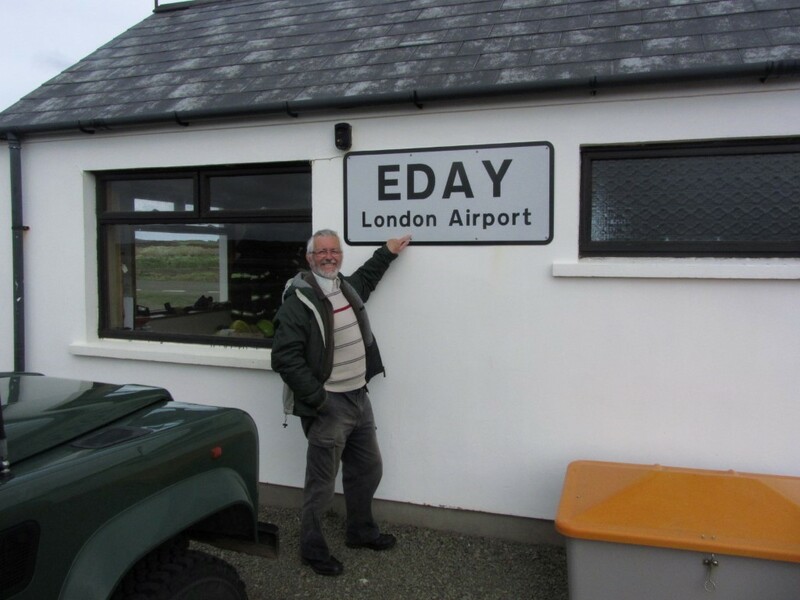 The tiny airport on the island is just so located at a spot called the Bay of London and hence is named London Airport. So imagine this London Airport with free parking, absolutely deserted, and no aircraft. I managed to get to the ‘airside’ without being spotted by security. This is the other London Airport. 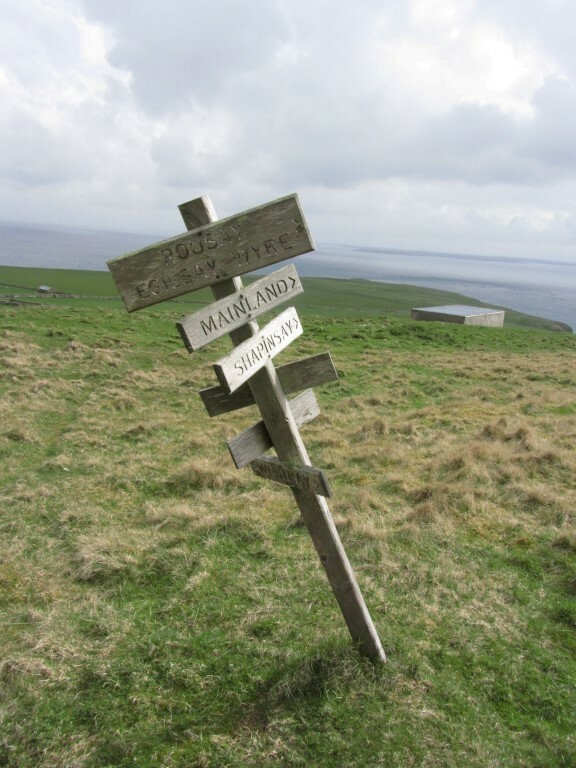 A wooden direction indicator on Ward Hill near the southern end of Eday. Returning to the ferry terminal it had been a great day out to a place in the British Isles where few venture. A pleasant early spring day was on the forecast, but when we reached Dennis Knoll Car Park near Hathersage there was a biting cold wind. 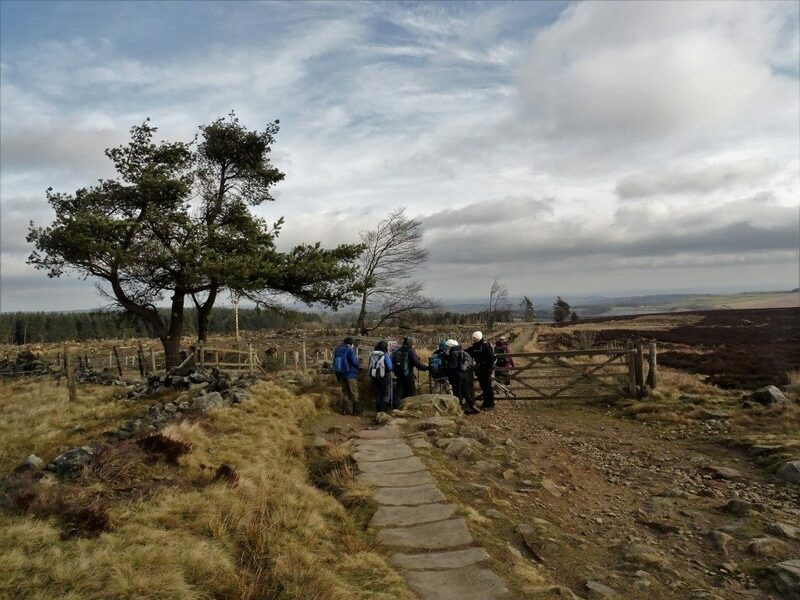 Ten of us set off up the track to Stanage Edge and across to the Stanedge Pole. As we dropped down towards Redmires Reservoir we found a sheltered grassy bank for our coffee stop. Unfortunately the Reservoir has been drained while work on the dam is being carried out. When we reached Wyming Drive the wide track took us along the river joining Redmires and Rivelin Reservoirs. We left the drive at a path marked Reddicar Woods and climbed steadily onto the moors. In front of us was the Headstone. This is a naturally occurring block of grit stone surrounded by a sea of smaller rocks due to many fractures in the rock. 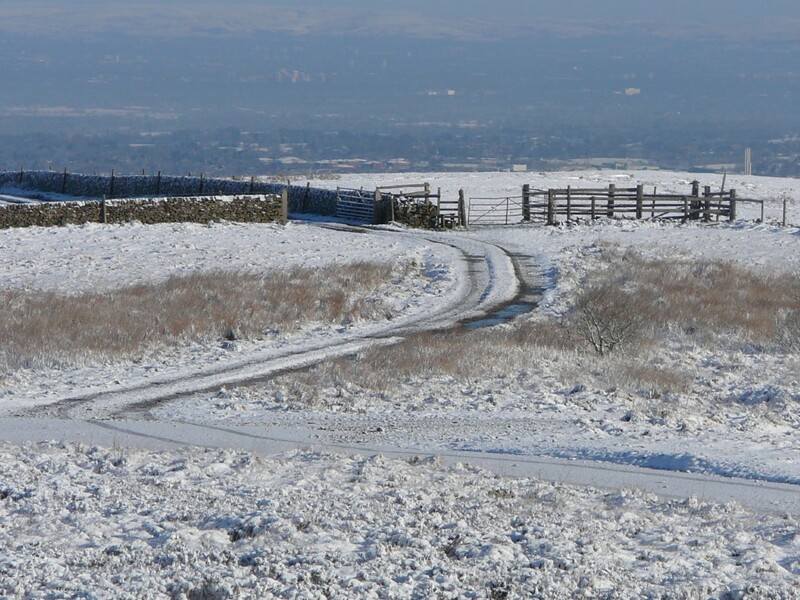 The views across the moors towards Sheffield were magnificent. We could also see Crawshaw Lodge across the Valley. We climbed up the fields to it and then turned left along the Roman Road. 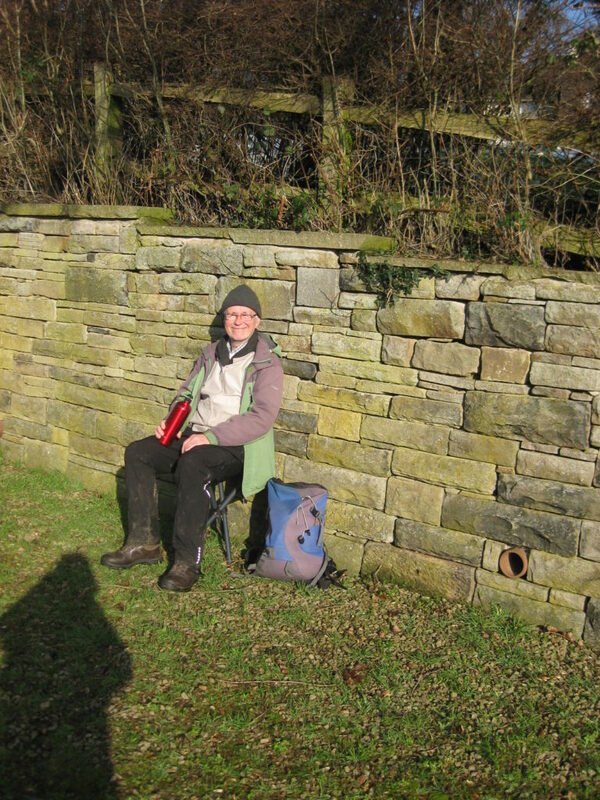 We had lunch sheltering behind a wall with great views towards Hallam Moor. 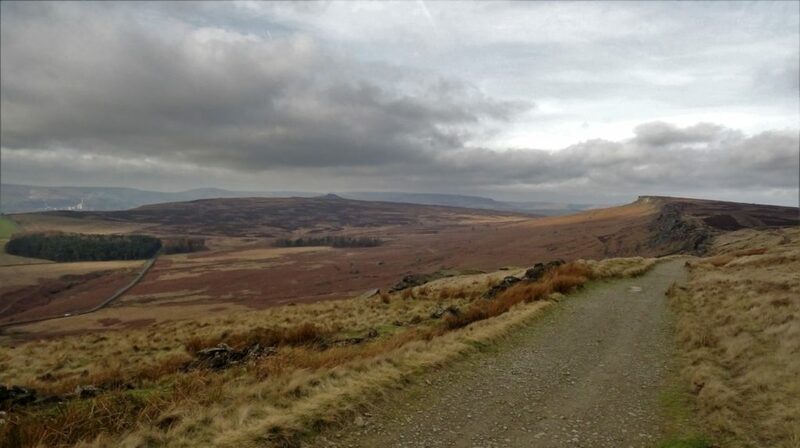 We soon reached Moscar Lodge and then crossed the A57 to reach the path up to Stanage Edge. Again we had good views towards Ladybower Reservoir, Win Hill and Fairbrook Naze. We followed the path below the rocks which gave us lovely views of the edge with winter sunshine on them. Just before we dropped down to the car park there were millstones all over the hillside in the bracken. Millstone production was one of the main industries in the Peak District starting in the 14th century and reaching its peak in the late 17th century. It disappeared suddenly in the mid 18th century when white bread became fashionable. 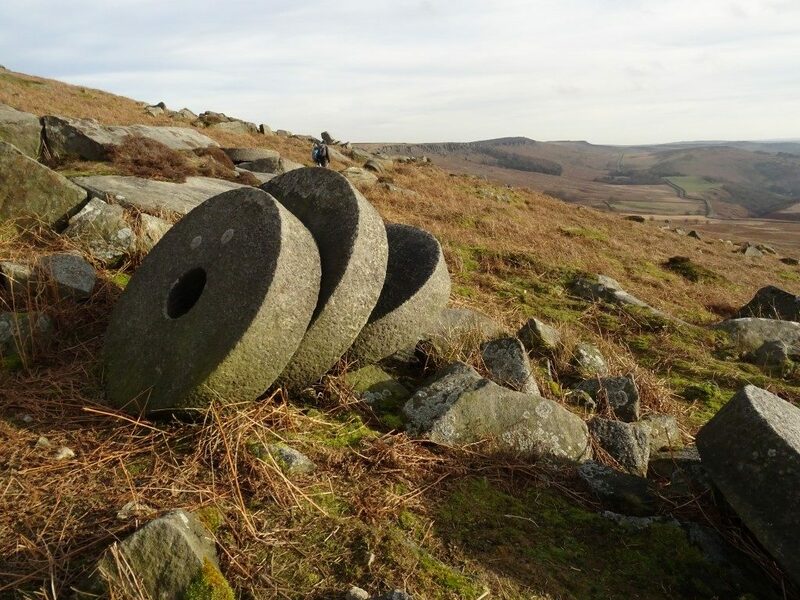 The gritstone turned flour a grey colour whereas French millstones were capable of producing white flour. 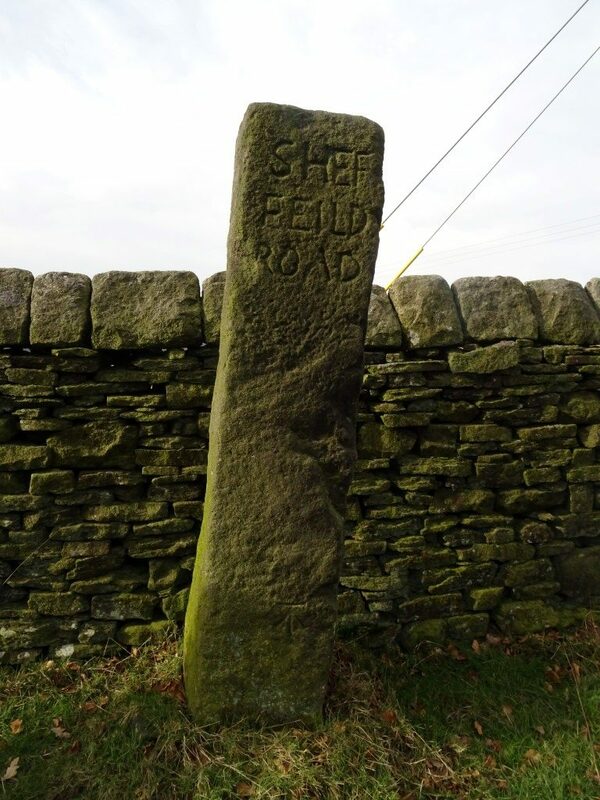 The stones now lie exactly where they were made and are now the emblem of the Peak District. 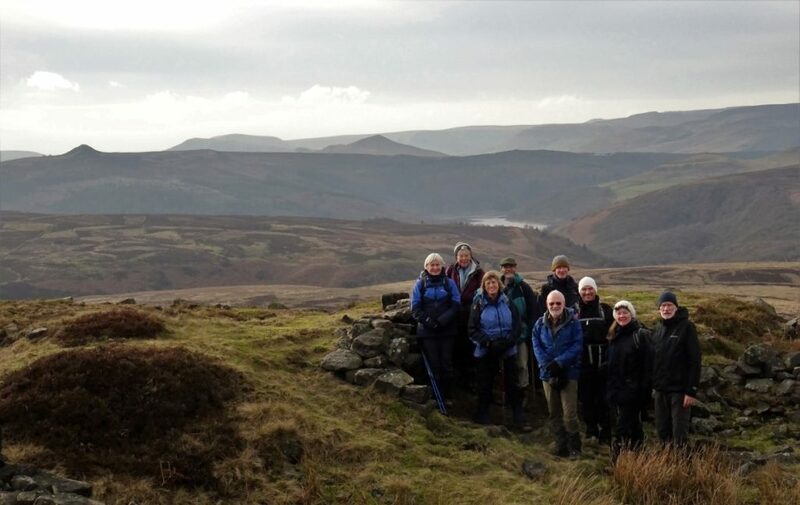 The group on High Neb with a view towards Win Hill and Ladybower Reservoir. 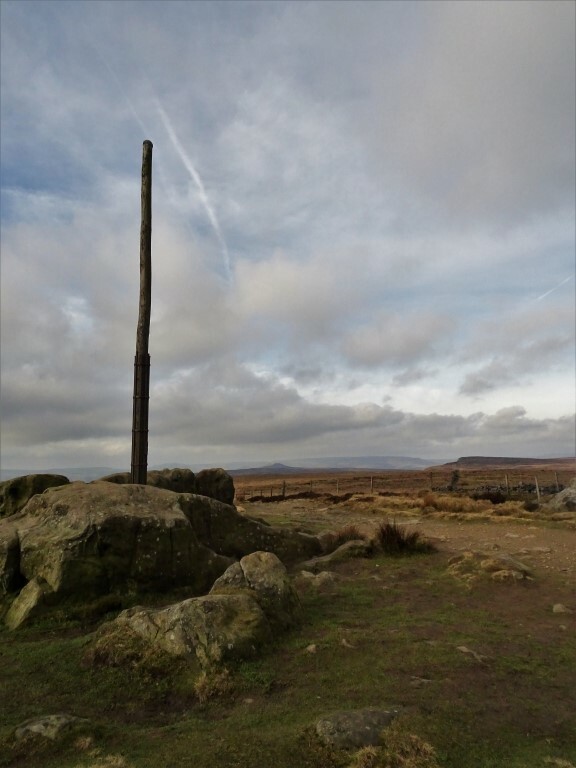 Stanedge Pole and the bleak moorland. The party walking on a cold day near Stanedge Pole. A old milestone on the Sheffield Road together with a bench mark. Finished millstones lie amongst the bracken below Stanage Edge. The Long Causeway at Stanage Edge. 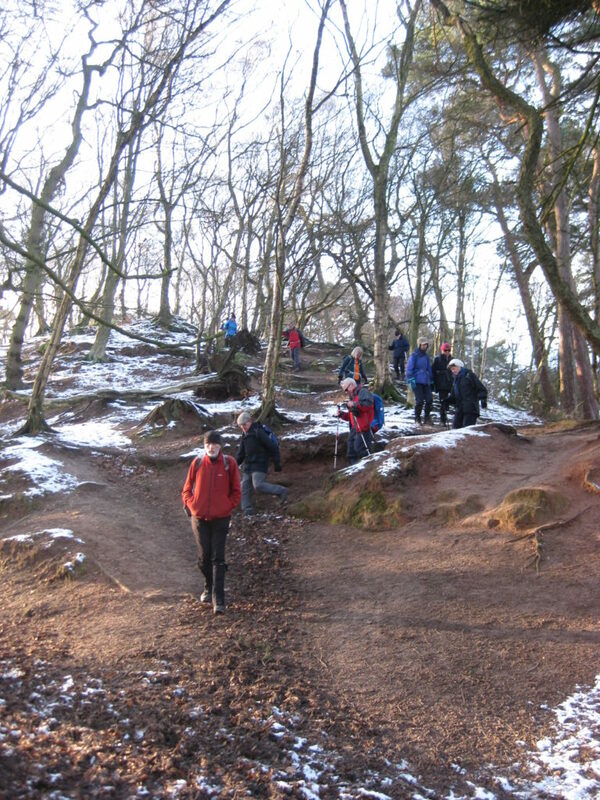 A recent East Cheshire Ramblers walk started at Alderley Edge. This was once reported to be the “Champagne Capital of Britain” due to its many famous residents. 13 ECR members started to climb to “The Edge” up a cobbled road, flanked by imposing houses, testifying to the aforementioned residents. Leaving the cobbles, we went along a short path to enter the National Trust land. It is a site of Special Scientific Interest because of its geology and history of copper mining dating back to the Bronze Age, and it is also known for its wizard myth, which inspired the novel “The Weirdstone of Brisingamen” by Alan Garner. We walked past the Wizard’s Well where, if you look carefully, you can see the outline of a wizard’s face and the words, “Drink of this and take thy fill for the water falls by the Wizards will”. From here we walked past the Armada Beacon, one of a number of beacons set up in Tudor times, to act as an early warning system throughout the country. Next, it was on to Stormy Point, from where there were magnificent views of the Cheshire countryside as there was on our walk. We then we descended to cross the Mottram road. Our route then took us along field paths, first in a northerly and then in a north easterly direction passing several farms, until we reached the A538 which was followed for a short distance. 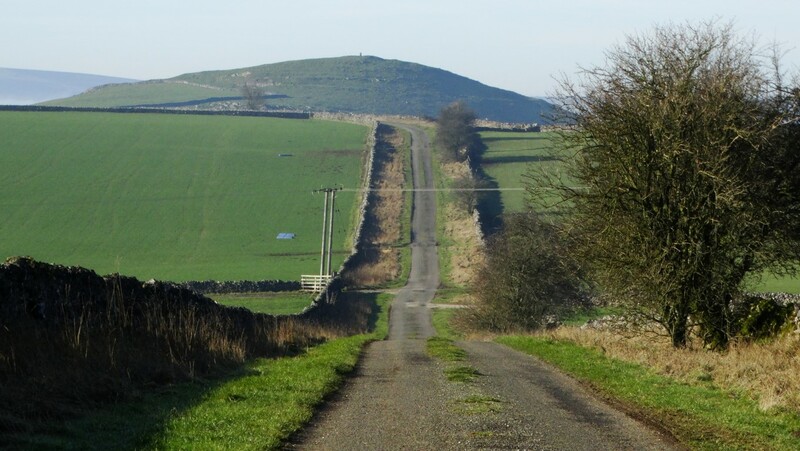 Continuing north- easterly we reached Mottram Bridge and then Bonis Hall Road, where we turned to the south east and used field paths again to walk almost parallel to the road to reach Top o’th’Hill Farm. From here we changed our bearing again and walked south west, crossing the Bollin Valley Way to crossing the edge of the Mottram Hall Golf Course on our way to reach and join the North Cheshire Way, a long-distance path which starts near Ellesmere Port and ends in Disley. We followed this path for some time, skirting Hare Hill, another National Trust property, before arriving back at “The Edge” and having a well-earned break in the picnic area near the car park. From here it was just a question of descending to Nether Alderley and then following the path parallel to the Chelford road to arrive back at our starting point. 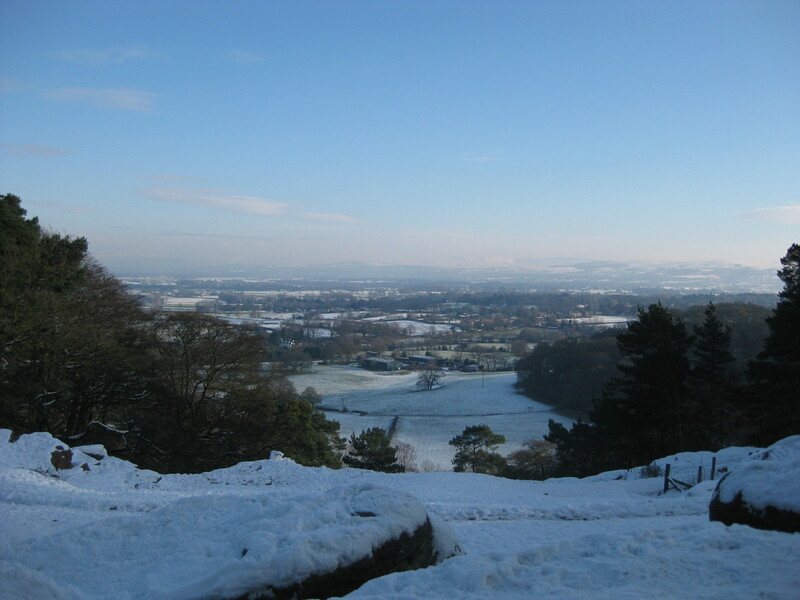 The glorious snowy view from Alderley Edge. 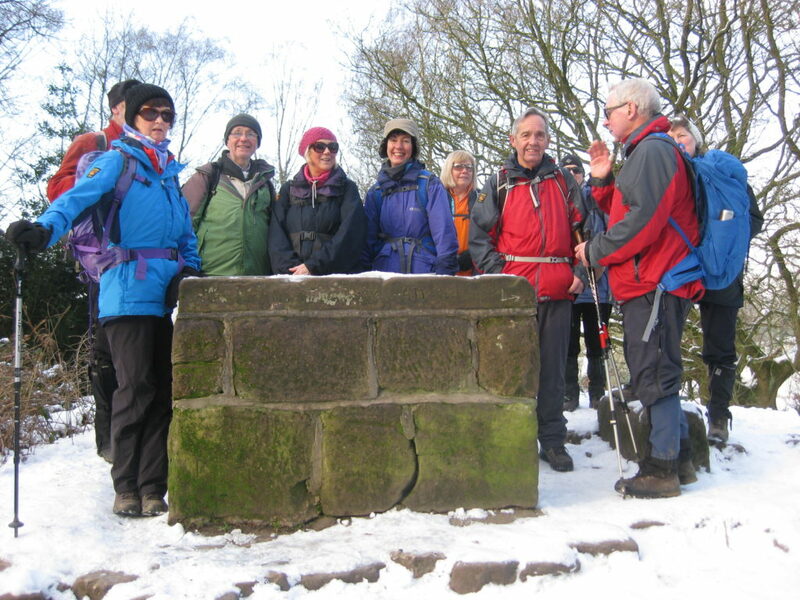 Most of the group gathered around the Armada Beacon on Alderley Edge. Morning coffee break near Hough. 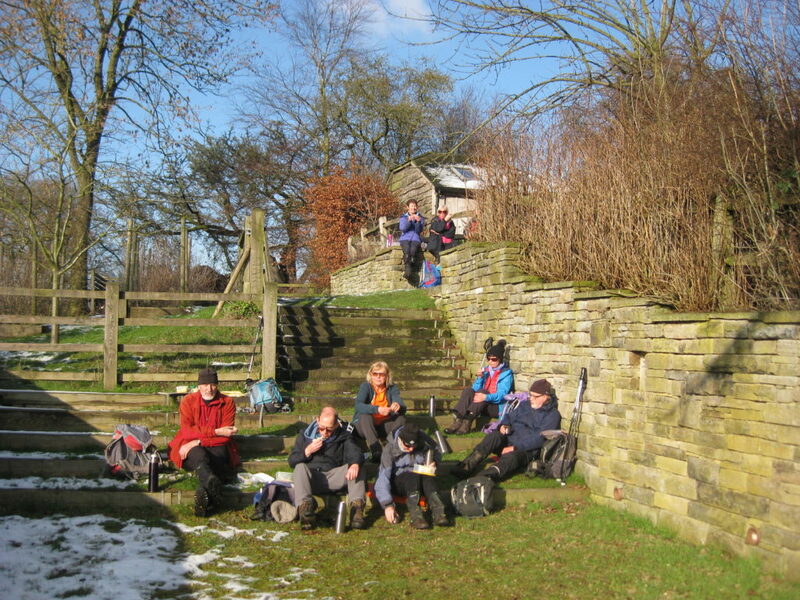 Making the most of the winter sunshine during our lunch stop near Hunter’s Pool. Some one who tagged along on this walk! 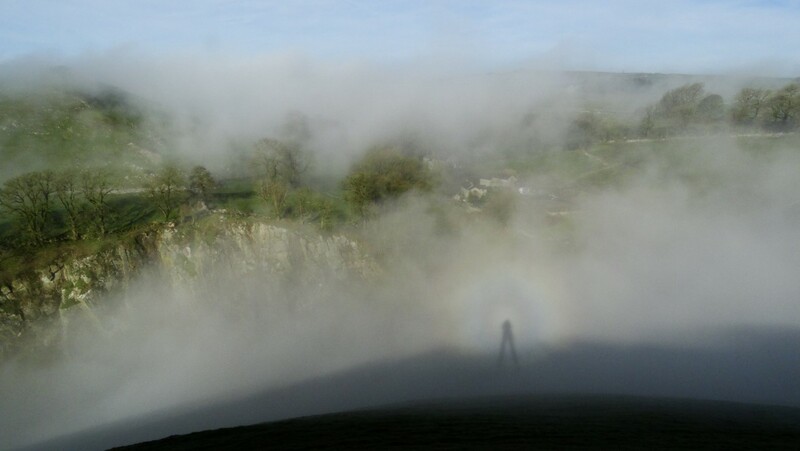 Encounter with ‘The Grey Man of High Wheeldon’ or is this my own shadow. Just once in awhile you pick one of those days for a walk which unknowingly when you set out has that extra ‘ingredient’. On this occasion it was moisture which made all the difference as we shall see. With the prospect of a really fine sunny day last week I decided at fairly short notice to go on a walk in the Peak District. I wanted to go somewhere not too far away and yet explore some new places. On High Wheeldon was a trig point that I hadn’t recorded a visit although I had been there some time in the past, and secondly the hill known as Carder Low which had some open access looked an area worthy of including in my walk. With this in mind, I set off with the aim of parking in Monyash. Driving up to the Cat & Fiddle I noted that the Cheshire Plain was choked in a cold air inversion and the mountains of Wales stuck out clearly beyond. Ahead of me I was surprised to see another cold air inversion to the east but for now I felt that Monyash would be high enough to be above the fog ceiling. My journey down the A515 revealed otherwise as I drove from the bright sunshine into the gloom. Indeed Monyash was well into the fog but with a good weather forecast I expected that the fog would soon disperse. I donned warm walking gear in a temperature only just above freezing and set out from the village in very poor visibility. The sun was just a pale disc in the sky and heading west and walking back along the B5055 so the sunlight was getting stronger with just that hint of blue sky directly above me. I now took the driveway to the farm known as The Whim. 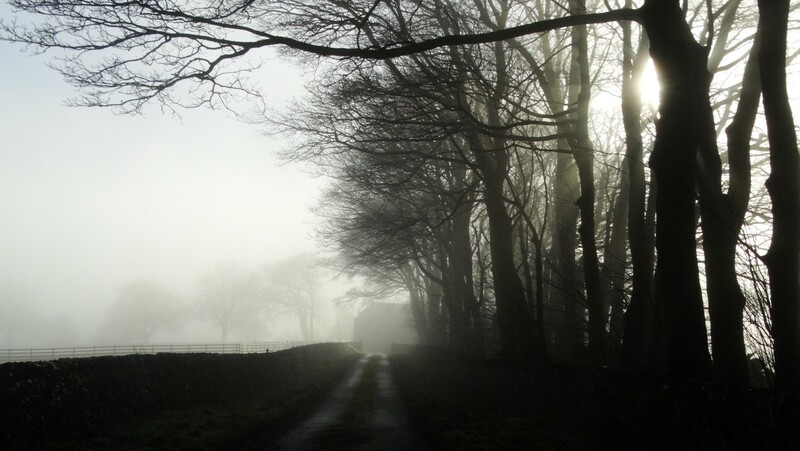 The sun breaking through the fog in this atmospheric picture on the driveway to The Whim near Monyash. 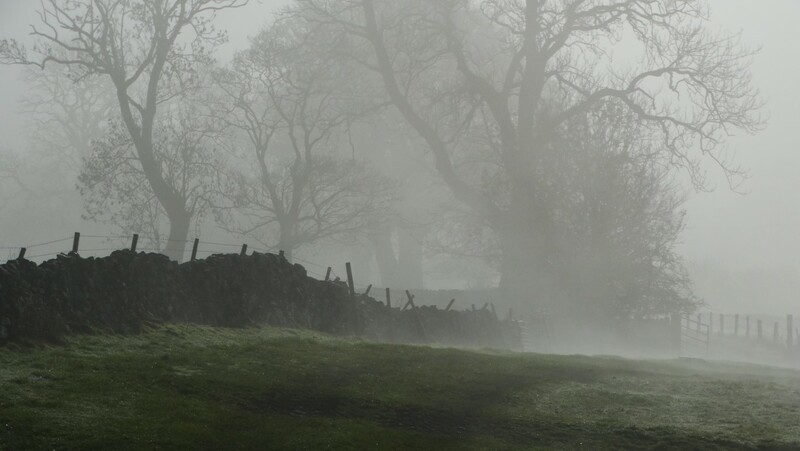 With low sunshine and fog it made for some interesting photographic conditions. Fog was still thick in the fields beyond The Whim and what I thought was a herd of cattle were a group of donkeys as I drew closer to them. Reaching the A515 at Bull-I’- th’-Thorn the fog was thinning and all of a sudden I was out into the bright morning sunshine. I continued on a field path west before joining the lane through Hurdlow Town. This small hamlet has some old properties with both Hurdlow Manor and Hurdlow Hall displaying dates from the 1600’s above the front doors. En route on the quiet lane from Hurdlow Town towards High Wheeldon. Chrome Hill just pokes out above the fog ceiling. 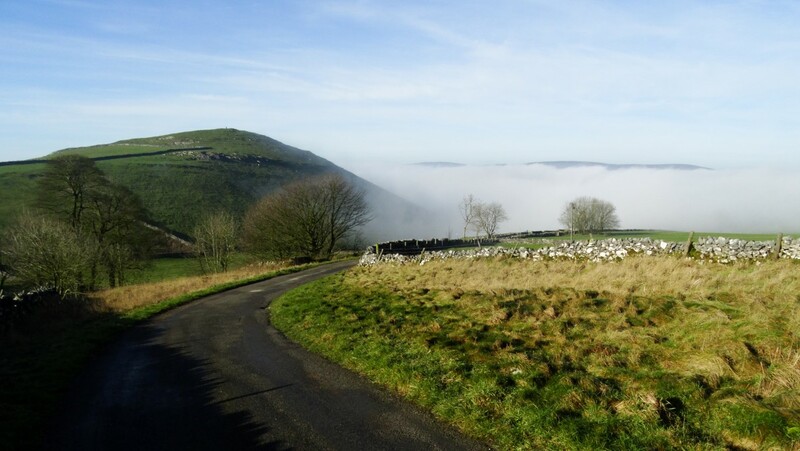 I had bright winter sunshine as I continued west towards Wheeldon Trees but I soon noticed that the fog was still choking the Dove Valley as I neared High Wheeldon. 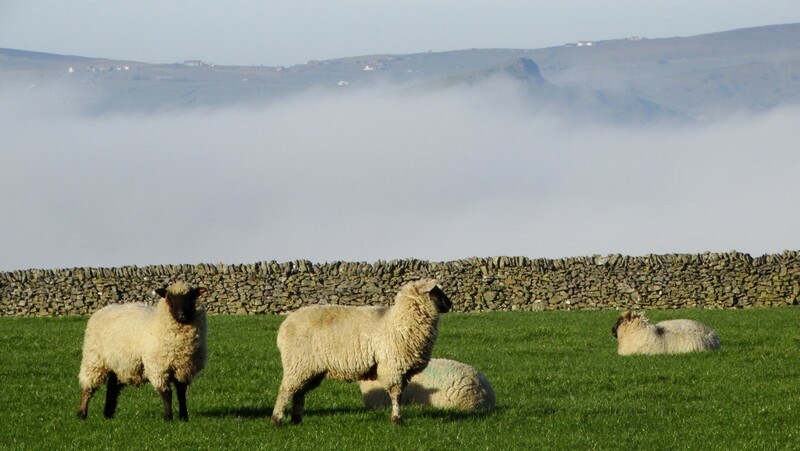 The question now was would I’d be in time to climb High Wheeldon to view the cold air inversion. By the farm at Wheeldon Trees I took the path west to make the short and steep ascent to the summit and was rewarded with a magical scene. From my perch I was a couple of hundred feet above the fog ceiling. To the northwest, Chrome Hill just poked out through the cloud and the higher land beyond was clear above the fog. I had picked the perfect time and so it was a good spot to stop in the sunshine for my morning break. There was hardly a breath of air blowing and the only sound was the occasional skylark overhead. Now this is what makes walking so rewarding at times. Later, I was joined by a young family who were on holiday locally. Walking the lane near Wheeldon Trees and hoping that I get to the top of High Wheeldon before the cold air inversion disperses. Morning break. This will do nicely. Just the sound of skylarks overhead on this perfectly still morning on the summit of High Wheeldon. We departed with me taking the route down the steepening northwest slope. The next part of my walk would be in the fog, or so I thought. I wanted to take a look a Fox Hole Cave which lies just north of the summit of High Wheeldon. 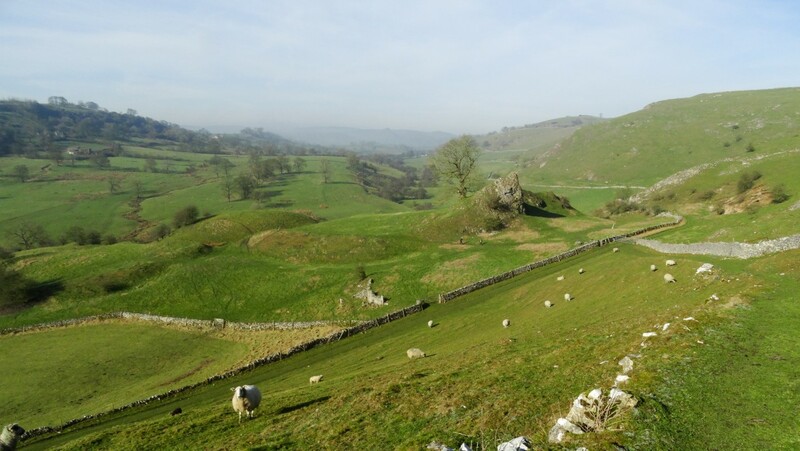 The cave which has a narrow entrance and is guarded with an iron gate has produced many finds and it is believed to be the oldest site in Derbyshire with evidence of human occupation. A number of partial excavations, carried out between 1928 and the early 1980s, have produced Mesolithic, Neolithic, Beaker, Bronze Age and Roman material, but it is the cave’s Palaeolithic context that makes it of particular interest. Later Upper Palaeolithic artefacts of flint and antler have been found in association with charcoal, denoting a hearth, and bones of horse and red deer, split and therefore indicative of human activity. Two recent radiocarbon dates of c.12000BP (Before Present) have been obtained from antler spearpoints from the cave. The monument includes all the deposits within the cave, and includes the flat area outside the cave entrance. 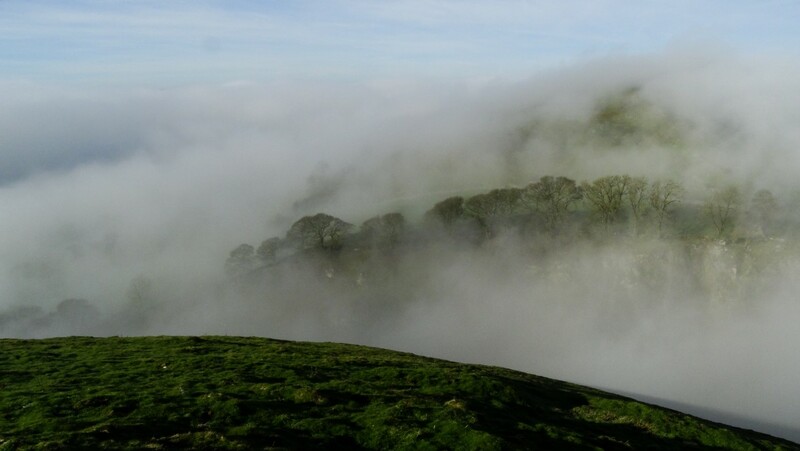 Fog drifts around Aldery Cliff below High Wheeldon. to perspective. The apparent magnification of size of the shadow is an optical illusion that occurs when the observer judges his or her shadow on relatively nearby clouds to be at the same distance as faraway land objects seen through gaps in the clouds, or when there are no reference points by which to judge its size. The shadow also falls on water droplets of varying distances from the eye, confusing depth perception. The ghost can appear to move (sometimes suddenly) because of the movement of the cloud layer and variations in density within the cloud. (Explanation from Wikipedia). 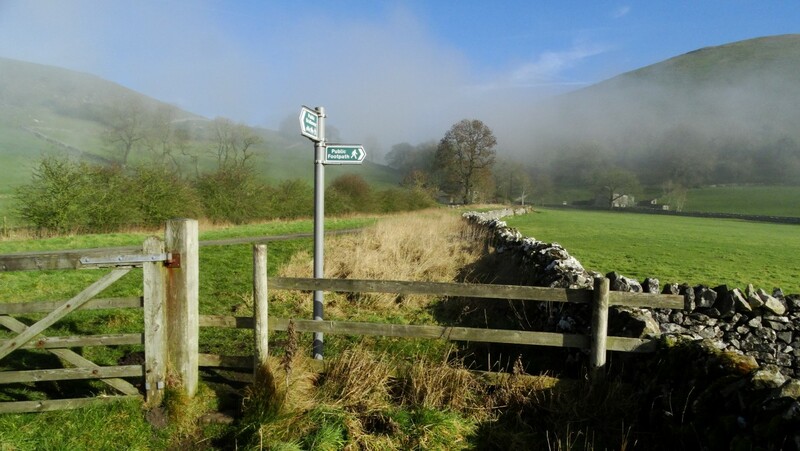 The footpath junction on Green Lane below High Wheeldon as the fog begins to disperse. Once down into the fog so the illusion disappeared and by now the sun was beginning to break through the fog. I headed down to Green Lane before taking the path southeast to Crowdicote. There was now another atmospheric magical moment where the sun was evaporating the heavy dew and for awhile I was walking through what looked like a shallow layer of dry ice similar to what they use on stage during a musical performance. It all seemed very unreal as I walked along in this magical landscape. It only lasted a few minutes and by the time I’d reach Crowdicote it had all but gone. A magical atmospheric moment with the sun beginning to evaporate the heavy morning dew giving rise to shallow drifting fog. Just magical. Imagine walking back in say the 16th century on a fine still February morning. 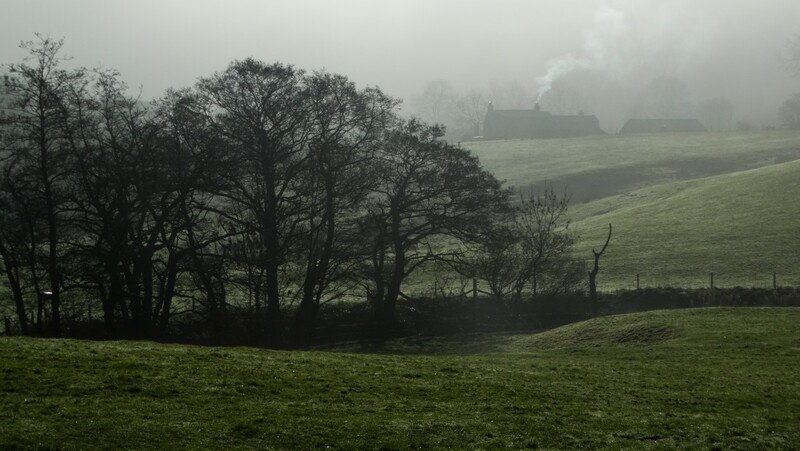 Smoke drifts upwards from the outline of a nearby farmhouse. You can felle the warmth of the sunshine for the first time this year. I now continued along the valley towards Pilsbury Castle on this perfectly still and hazy February morning with the only sound being skylarks above. Smoke drifted upwards from the dark outline of a nearby farmhouse insomuch it felt as if I had travelled back centuries in time. Later, the hazy outline of Pilsbury Castle came into view. Reaching the place I paused to study what was left. The castle earthworks which is set on a highpoint overlooking the Dove Valley is unusual insomuch that it was never developed further that a motte and bailey defence work and only guarded with wooden fencing and wooden watch towers. With no brick work, the castle probably only survived into the early 13th century before being abandoned, and today we only see the mounds and ditches and no walls. Pilsbury Castle. The mounds and ditches are clearly defined from the path above. My next objective was to get to Carder Low for my lunch stop. A pleasant path was followed across several fields and on reaching the open access land made directly for the summit. 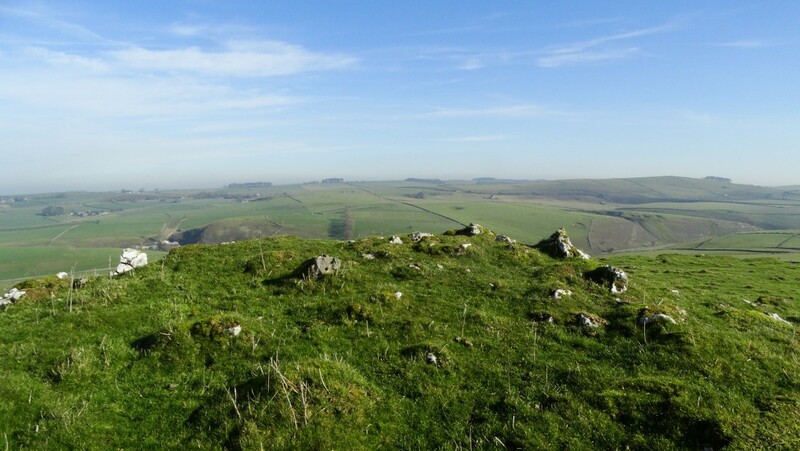 The summit is crowned with an ancient cairn where many prehistoric artefacts have been found however there is little evidence visible nowadays but the summit made an idea lunch stop. It was simply just wonderful to be out on a day like today and despite the temperature not being that high and with a lack of breeze the sun felt quite warm. Carder Low and my lunch stop. This area lies on open access land. With lunch over, I headed southeast to join the right of way but had to squeeze between a wall and barbwire fence whilst crossing the open access land. I now joined a path eastwards passing through old lead workings before joining the lane north to Vincent House. From here I took the path northeast via Darley Farm and Moscar Farm before crossing the A515 once more then taking a field path across to the road heading down towards Monyash. Rather than follow the road all the way into the village, I opted to take a field path then enclosed path to the west and in the process found a walking pole which I handed in at the cafe in the village. It was merely a case of adding yet another walking pole to the collection they already had. I intend leading this walk for the group during the latter half of 2019 but I can’t guarantee the same magical weather. Sea fog filters in from the Irish Sea to obscure the lower hills. Yr Eifl is seen in the distance. 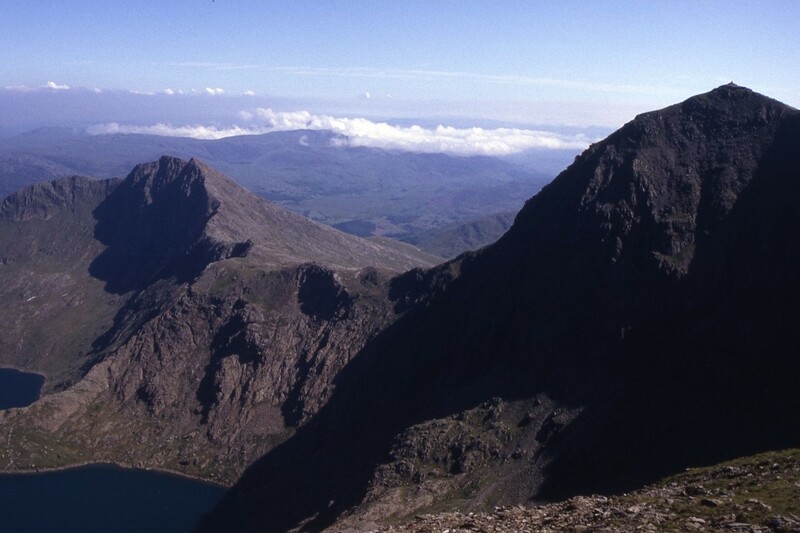 I have been up Snowdon so many times and have approached it from all angles whether it’s been via the gentle Llanberis Path or via Crib Goch but this walk back in 1993 remains as one of the most memorable. At the time with a young family, any strenuous walking usually took second place but wasn’t necessarily out of the question. For many years our annual holiday was in self catering establishments and our neighbours from two doors away joined us as they had children of similar ages. Our holidays took us to many parts of England and Wales and we always seemed to be dogged with bad weather with beach days clad in waterproofs rather than beach wear but alas our first full day of our holiday in North Wales dawned with perfect sunny weather and a chance to get a day of serious walking in. The day started badly with one child in our party having severe toothache and hence this required a trip to Bangor Hospital for a tooth extraction and so the rest of us spent a morning on the beach at Dinas Dinlle enjoying the glorious sunshine. As the hours slipped by, thoughts of any hill walking today looked slim but with a return of the others at lunchtime, there was still the possibility that my neighbour Tim and me making an ascent of Snowdon in the afternoon and returning in the evening. It was a warm afternoon when Tim and I arrived in Llanberis which was our starting point and we soon set out toiling up the road leading to the Llanberis Path. This was our first ascent of Snowdon via this route and we chose it as we had a time limit and wanted to be back before dusk. 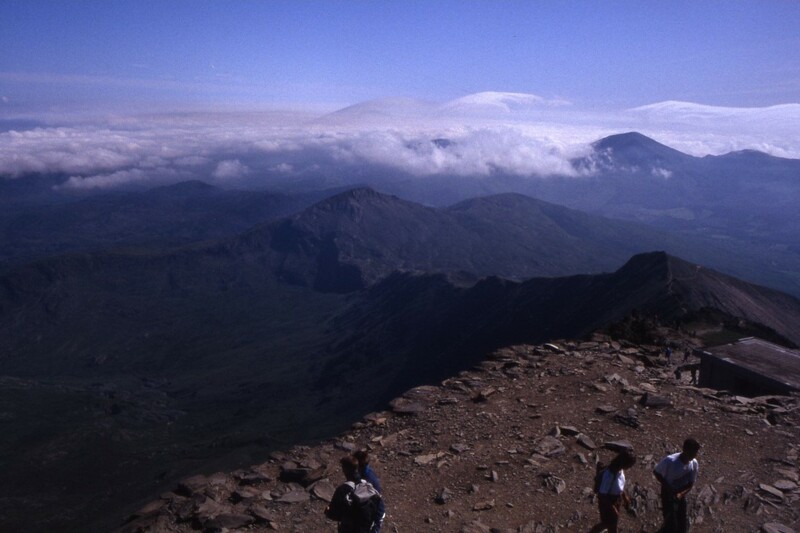 As we ascended, then good views opened out towards Moel Eilio. We stopped at Halfway House for a much needed cup of tea before toiling on up the hot and dusty path. Beyond Clogwyn Station there was more breeze and after another half mile I suggested that we divert to take in the summit of Garnedd Ugain 1065 metres. The view from the top was breathtaking and came as quite a surprise after toiling up the mundane slope. By now sea fog from the Irish Sea was filtering in around the mountains so we pressed on smartly towards the summit of Snowdon in case we lost the views. From the top of Snowdon 1085 metres we were rewarded by excellent views. There was an ever changing cloudscape as sea mist edged in around Yr Eifl and Moel Hebog making them ‘islands above the cloud’. 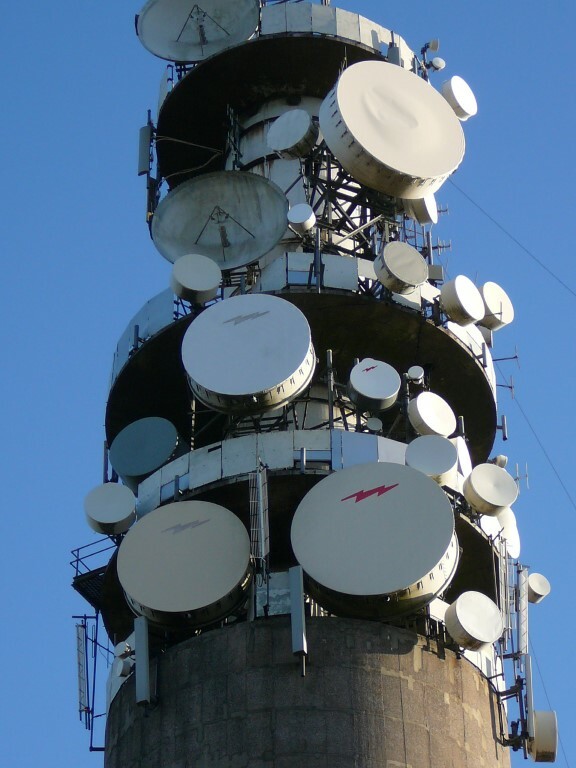 We spent nearly an hour on the summit savouring the views. Tim would have stayed longer but we still had some distance to go and it was already 6pm despite it being June. On Garnedd Ugain with the first signs that low cloud was spreading in. 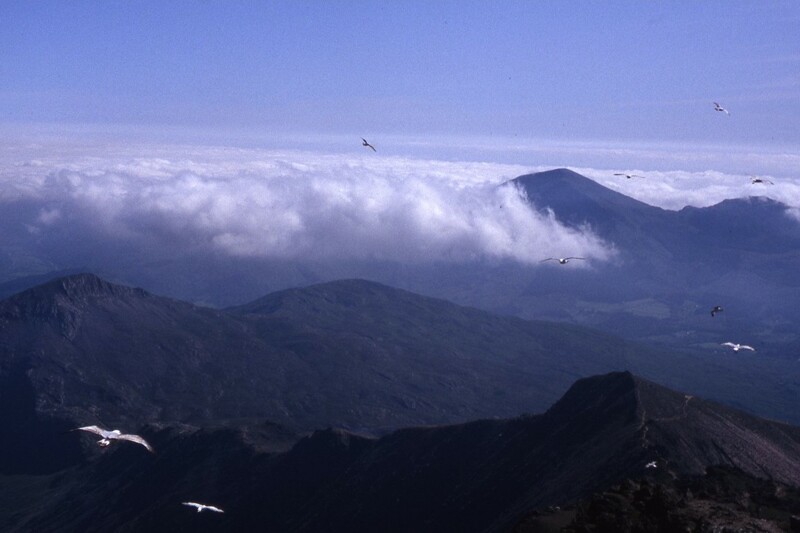 Late afternoon on the summit of Snowdon. The last walkers are leaving and now time to have the place to yourself. A cloud ‘fallen from the sky’ hangs on the lower slopes over Nantgwynant. 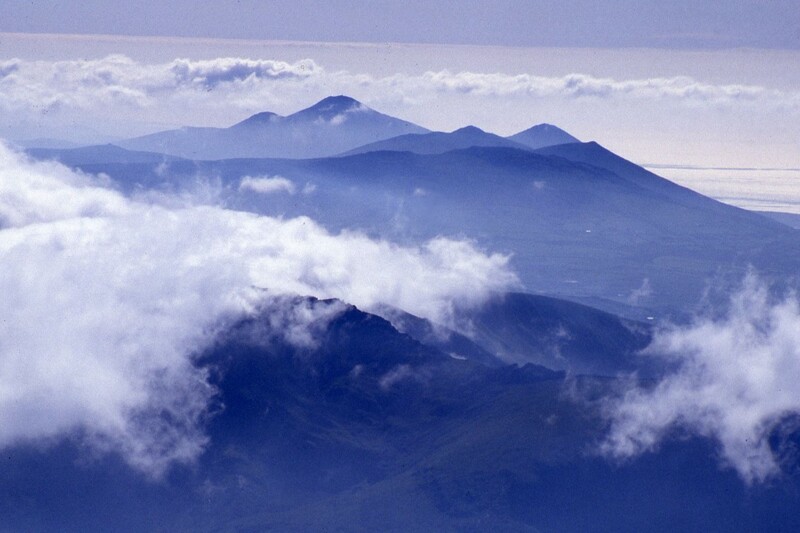 Moel Hebog pokes out above the cloud ceiling. 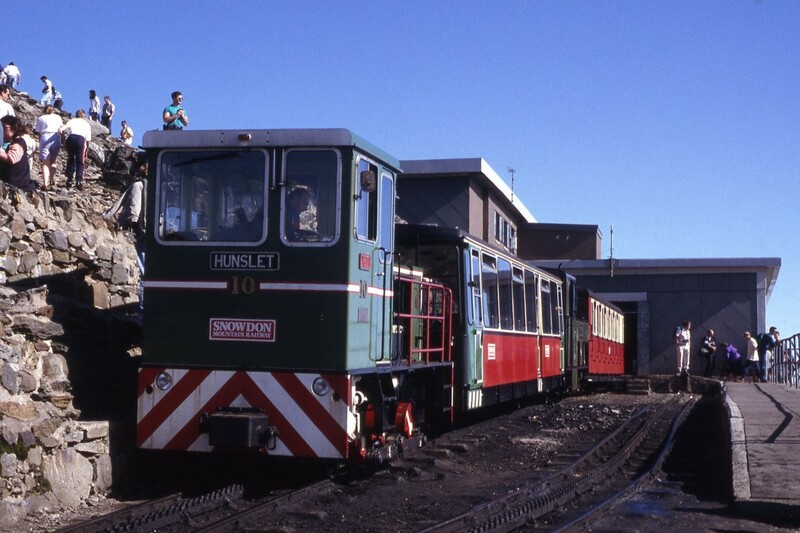 The last train of the day about to depart from Snowdon Summit but we are not catching it. Note the old cafe complex. For our descent we decided to return on the now deserted Snowdon Ranger Path to make a winding but easy descent to Bwlch Cwm Brwynog before an ascent to Moel Cynghorion 674 metres. The mist was now creeping over the lower summits but came and went from time to time. Our walk over Foel Goch 605 metres was mostly in cloud and ahead Moel Eilio was firmly into the cloud. We still had time to bag this peak but we wouldn’t get any views. The route was easy to follow as a boundary fence ran along the crest of the ridge and there was a path. Out of the mist appeared two walkers, the first we had seen since leaving Snowdon. On Moel Eilio 726 metres we rested awhile in the evening gloom. Momentarily the cloud lifted to enable us to get some photographs. Our descent to Llanberis was straightforward down the northeast ridge but we had lost the sunny end to the day but soon we were below the cloud. At the base of the steep slope we joined a track then lane to pass the Llanberis Youth Hostel. By 9pm we were back in Llanberis which left only a short walk to reach the car in a deserted car park to complete an excellent walk. Walking in a winter wonderland. A typical view as we neared the summit of Bosley Cloud. 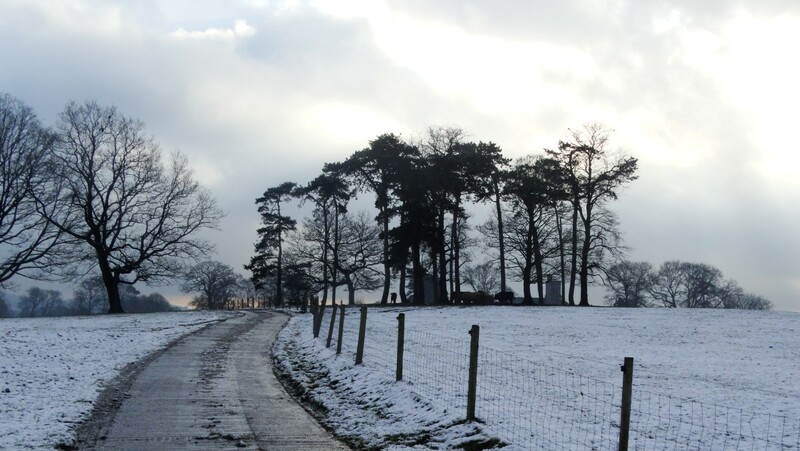 I responded to Ralph’s plea to fill a gap in the Long Walks midweek programme and with this being a linear walk and using the train to get to the start I decided to leave the walk as planned despite a good fall of overnight snow. Other ECR walks had been cancelled but at least the trains were running to time and so I walked to Macclesfield Station expecting so see a few familiar faces. In the end I boarded the 10.18am with not a walker in sight for the short journey to Congleton where I thought I might find one or two hardy walkers. 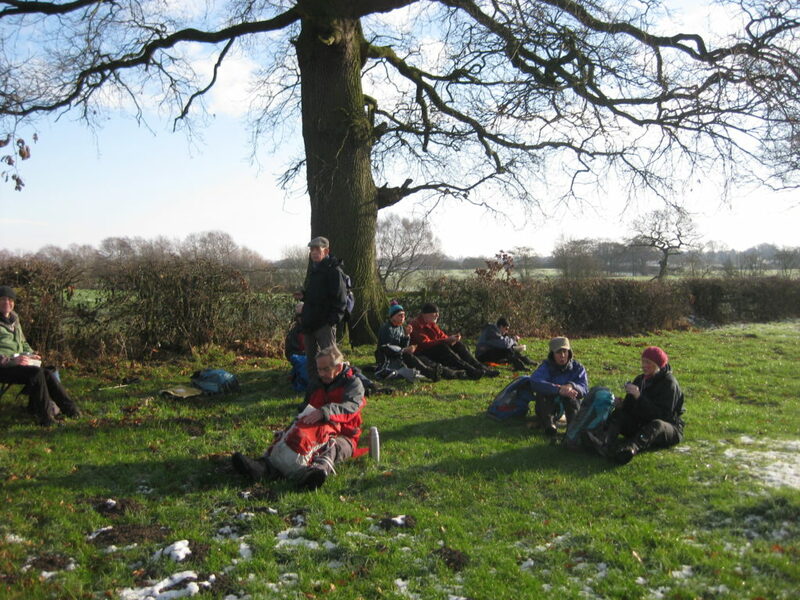 Alighting at Congleton, it was only Sue Thersby who emerged from the rear carriage and so it would be just a very small group of two of us for the walk back to Macclesfield. From Congleton Station we descended to join the towpath of the Macclesfield Canal. I had decided to wear my micro-spikes on my boots which initially worked well but as the snow was quite wet it rather stuck to my boots. From the towpath we joined the Biddulph Valley Way for a short distance before taking the field path to Overedge and then across more snowy fields to near Timbersbrook. We made good progress but trudging through the wet snow was proving tiresome. Heading uphill we crossed a lane before ascending a long flight of steps and at the top stopped for a late coffee stop. 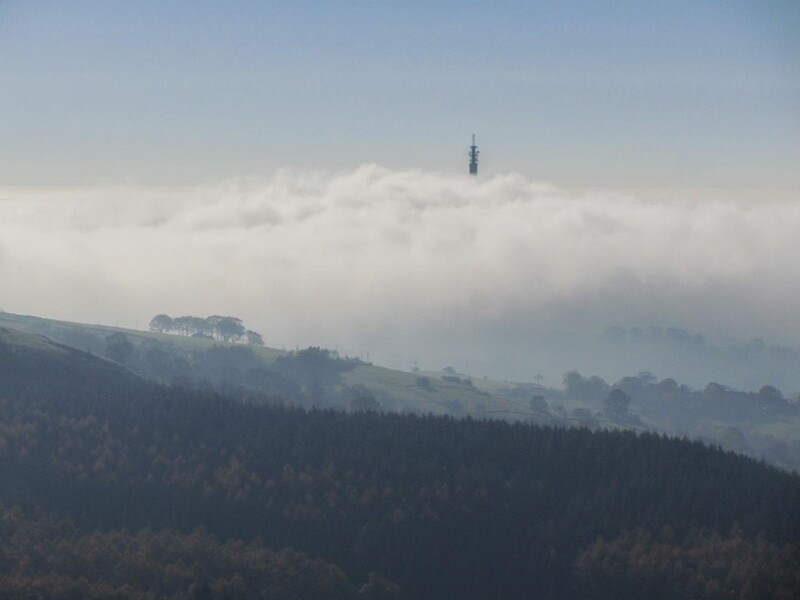 I was in two minds as to whether to walk up to Bosley Cloud as it was in thick fog but there was just that chance we might break out into bright sunshine. We didn’t, as the fog was thicker and the snow much deeper as we followed footprints towards the summit. 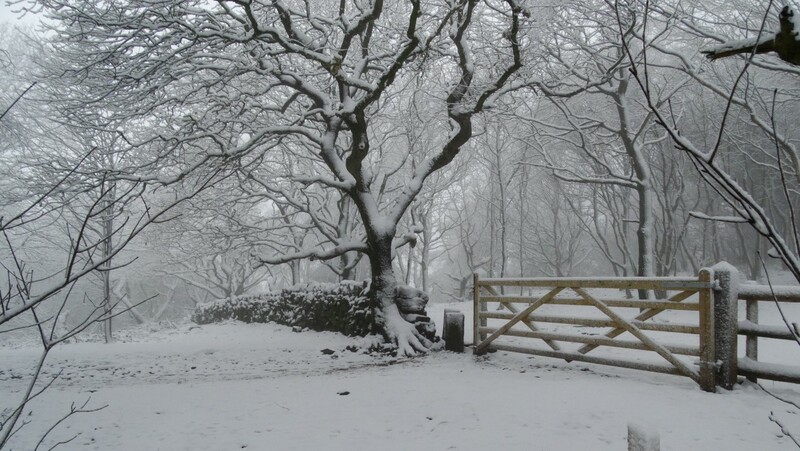 On the plus side was that we were now walking through a winter wonderland with everything coated in thick snow. The view on top was nil but not quite white out conditions. With no breeze it didn’t feel that cold. We were soon off eastwards before descending steps to join a lane. Turning left along the lane we made the mistake of turning right too soon and so opted to headed down across fields and not on a path but at least at the end there was a gate. It was lane walking now down to the River Dane. The roads were virtually snow free which made walking with micro-spikes less easy. Just prior to crossing the River Dane, we turned left along a muddy field path towards the Macclesfield Canal. With a thaw beginning to set in, conditions underfoot were proving quite muddy and wet. Reaching the Macclesfield Canal we stopped for lunch as it was now 1pm. Again we set off in the afternoon gloom and murk with hardly a breath of air blowing. We wandered up through the Bosley Locks where a lone boat owner with his dog was making his way up through the locks. Reaching the A54 we left the towpath to follow Station Road before heading west on the private surfaced track towards North Rode. It appeared that the low cloud and murk was lifting and by the time we reach North Rode, there was the hint of sunshine nearby. After the gloom, the sun was now beginning to break through as seen here near North Rode. We now headed north towards Gawsworth across several fields with afternoon sunshine from time to time which made all the difference. At Gawsworth Churchyard I opted to remove my micro-spikes as we now had some road walking. It made the going much easier. 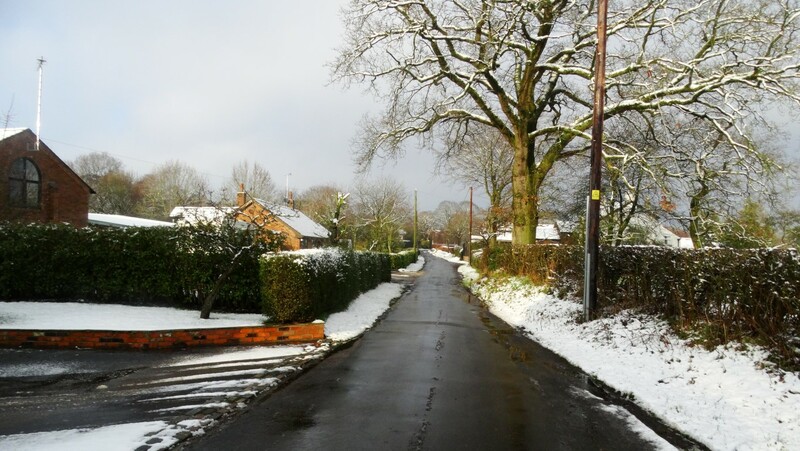 A path along a snowy field was followed to the southeast of the village before following Lowes Lane through Mosshouses. A watery field path was next followed around passing Danes Moss Farm. We had no choice afterwards but to follow the busy A536 in towards Macclesfield but then we opted to take the unofficial path across the playing fields and rough ground to gain Moss Lane. We were back in Macclesfield by 4pm having made very good progress and timing it well for Sue’s train. The thirteen miles of walking had taken us just over five hours. A slight thaw had set in by the time we reached Mosshouses. The roads were now clear of snow and the sun had made an appearance. Lunch stop on Black Hill with a panoramic view across Herefordshire and beyond. During my youth, the Black Mountains and the Brecon Beacons was my stomping ground and there were countless weekends, when, along with my walking group we would venture out from Bristol on a Friday evening to spend a couple of nights in one of the youth hostels in the area whether it be Brecon, Crickhowell or the former Capel-y-ffin. The latter was one of my favourites and was tucked a long way up the valley of the Vale of Ewyas, a deep valley which dissected the Black Mountains and leads up to the Gospel Pass. In those days the easy part of the journeywas getting to Abergavenny before a drive along narrow winding lanes in the dark of night which seemed to go on forever. With a car load of passengers and full of rucksacks and provisions for the weekend I just hoped that we didn’t meet anything. I was now back in Abergavenny for a few days with the plan of tracing some of the paths we took so many years ago and re living old memories. Getting above the clouds. A cold air inversion over Herefordshire. I had started off from the bottom of the hill in thick fog but knew that as I gained height I would break through the cloud ceiling. 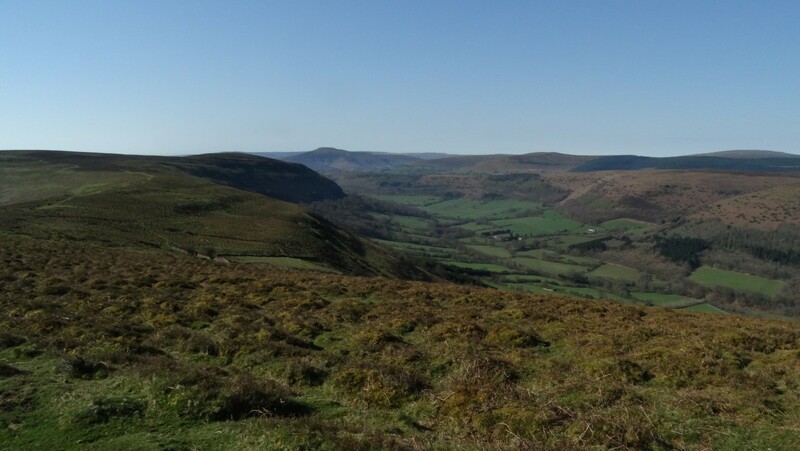 The Vale of Ewyas in the Black Mountains. To my left, the countryside below was still under a blanket of cloud. 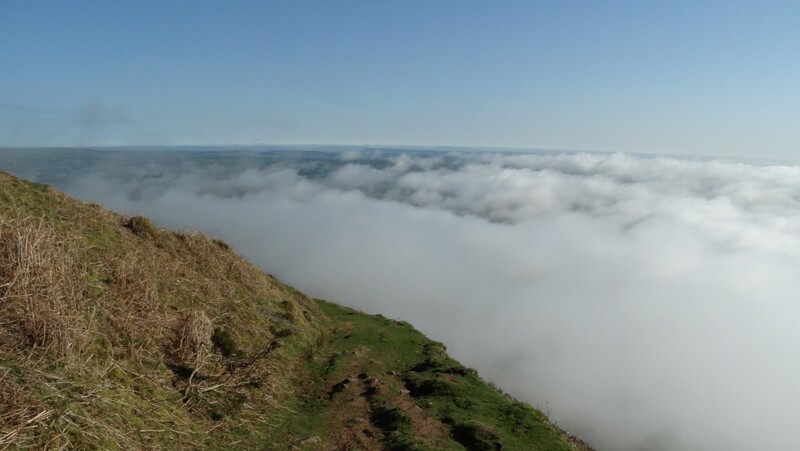 It’s a fine sunny spring morning as I set off from the new Premier Inn in Abergavenny but I soon run into fog on my short journey north to the village of Longtown which lies under the eastern shadow of the Black Mountains. Parking by the village hall, I set out in the fog conditions but I know that there is the likelihood of fine sunny weather as I gain height. With paths well signed, I opt to take the field path west from the village hall and drop down to cross the Olchon Brook. On the far side I have a long gradual ascent and pass through Cayo Farm en route. I am some distance and height above the farm when the cloud above me starts to brighten. Gaining the steep open hillside the sun is soon visible through the cloud and it doesn’t seem long before I break out into bright sunshine under a deep blue sky. I hurry upwards as I need to gain height to get some photographs and reaching the ridge above Rhiw Arw I pause to take some stunning photographs. I’m in luck and what a morning it is with a sheet of cloud stretching to the horizon to the southeast. The Vale of Ewyas over to the west on the other hand was clear of cloud altogether. 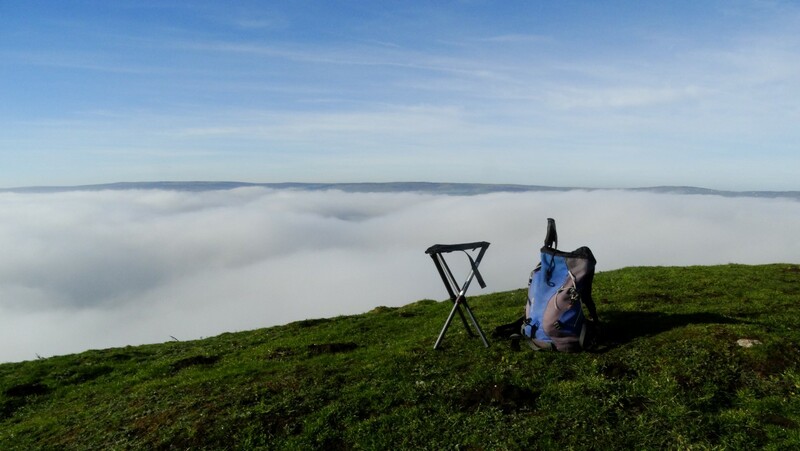 My walk north is now along the Offa’s Dyke Path has several miles of high level walking on a good path on what is like walking along the ridge of a roof and passing two trig points on the way. I am soon passing the first trig point at 552 metres and continue north making good progress. What a day to be out I think. The cold air inversion is now dispersing as higher land to the east starts to pierce the cloud ceiling and after an hour the cold air inversion has gone. Miles of ridge walking behind and ahead of me. 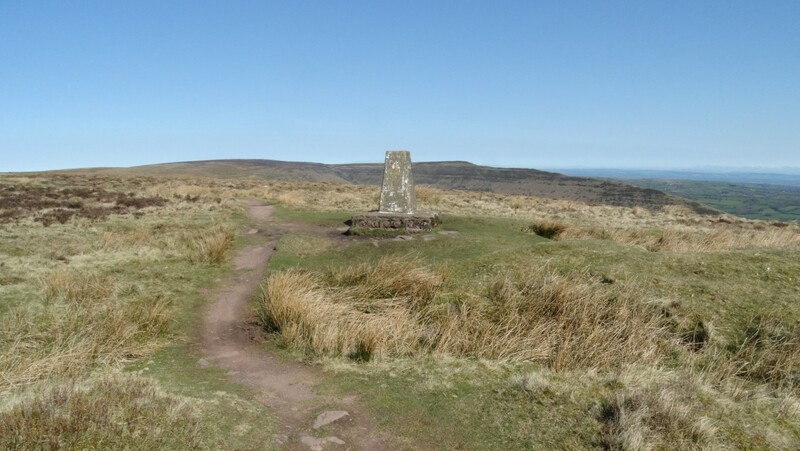 This is the second trig point that lies on the English/Welsh border on the Black Mountains. 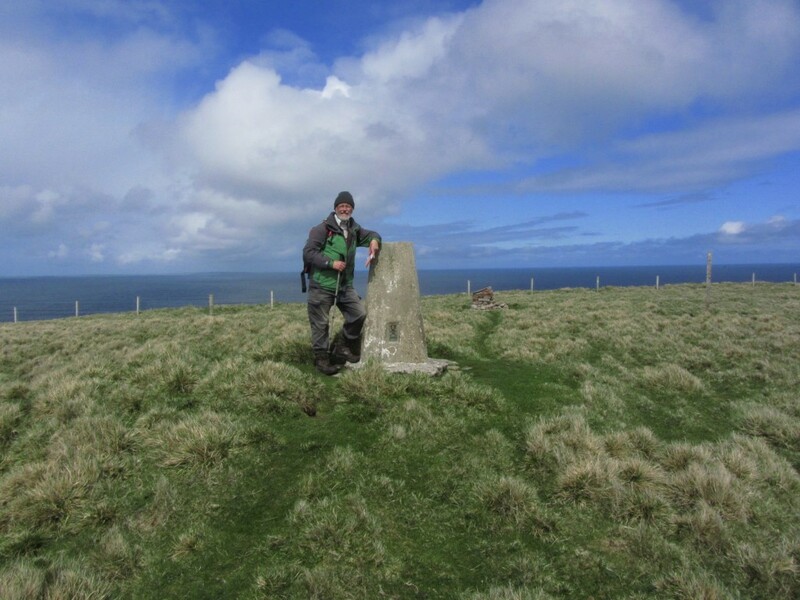 I continue north passing the second trig point at 610 metres to reach the highest land along the ridge at 703 metres. This is the county high point of Herefordshire and since joining the ridge I have been following the boundary between England and Wales. A bit beyond this high point, I leave the good path and head over rough ground to find the path leading to Black Hill. My plan is to have lunch on the summit, and having not passed anyone during the morning I now observe many people on the summit of Black Hill. Reaching the top, the place is awash with a large school party numbering around fifty. It certainly isn’t the place to have lunch or to photograph the trig point with so many children milling around the place. Instead I retreat to a quieter spot on the edge of the ridge to have my lunch. What a great spot this is with the countryside at my feet stretching away across Herefordshire towards the Midlands. With the school party gone, I re-visited the trig point before heading southeast along the narrow roof shape ridge. 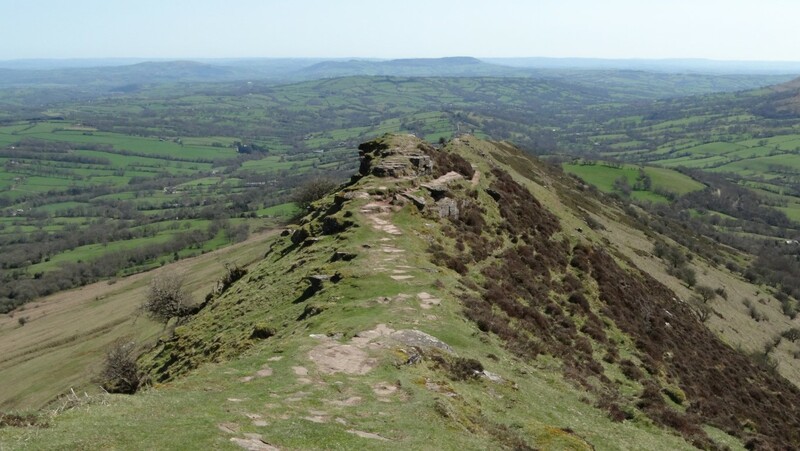 This ridge is also known as the Cat’s Back, as viewed from the Herefordshire side it looks like a crouching cat about to pounce. It is an excellent walk which gradually descends before dropping down to a rough car park which today is full. The ridge running southeast from Black Hill is also known as the Cat’s Back. 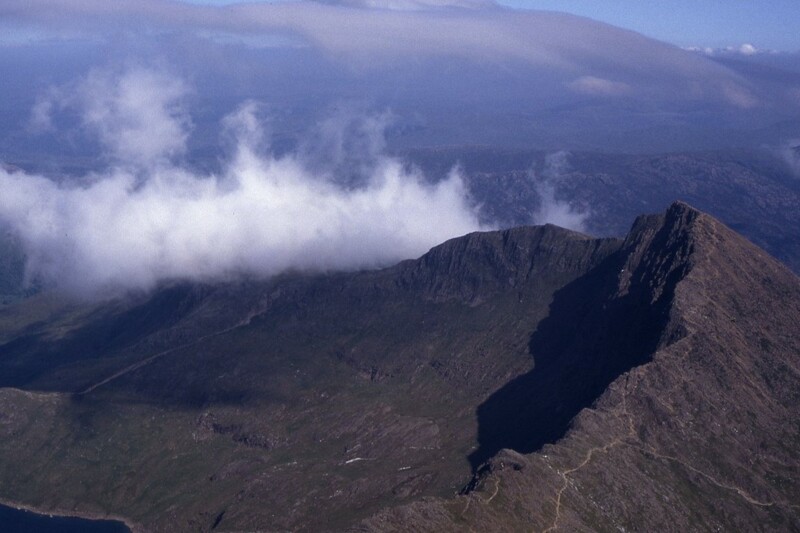 It provides a mile of excellent ridge walking. From here, I opt to take the path over Little Black Hill and down to Upper Blackhill Farm however, the path is ill defined and somewhere I lose it altogether. Eventually I am confronted by a field boundary with a stout fence and a steep almost vertical drop into a sunken lane. Searching around I find the correct exit to the lane. The return to Longtown is now along narrow and often sunken lanes but at least there is virtually no traffic in this secluded corner of Herefordshire. Reaching Llanveynoe on what was now a very warm spring afternoon I made a detour and find a seat in the shade of a yew tree beside the little church for a leisurely break in this idyllic spot. 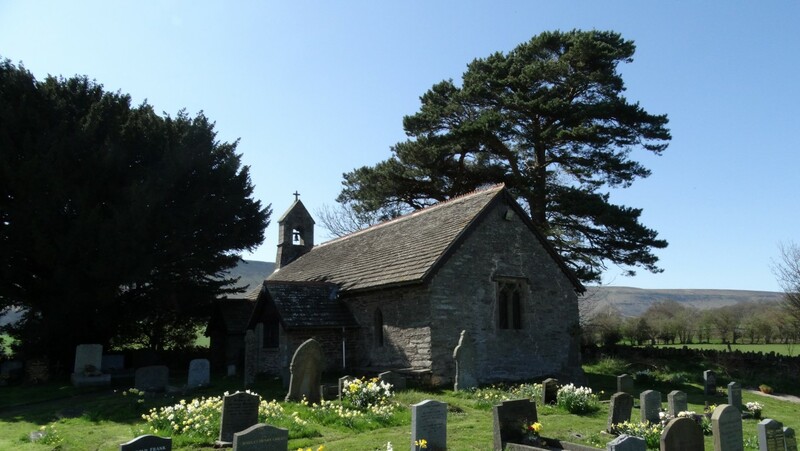 The church is dedicated to St Beuno and it is thought that St Beuno came to Llanveynoe in 600 AD and founded a small monastery on what was a pagan site. This was either situated where the church now stands, or on the site of Olchon Court, close by. Indeed, recent archaeological excavations in the grounds of the court have found what could be the foundations of a monastic building. Beuno was born in 560 AD at Berriew in mid-Wales, but his education was at Caerwent in South Wales under St Tangus (Tatheus). He was the nephew of that great Welsh saint, Cadoc, and his grandfather was King Brychan of Brecknock (Brecon). After a few years stay at Llanveynoe, Beuno headed north back to Berriew where he attended and ministered at his father’s funeral. From there he travelled north to the district of Tegengle and what is now Holywell, Flintshire, where his niece St Winifred was living. His most famous monastery was at Clynnog Fawr on the Lleyn Peninsula, but he established another 10 churches in North Wales. St Beuno died at Clynnog Fawr in 640 or 642 AD. (Note that our group visited St Beuno’s Church at Pistyll on our weekend walk from Trefor to Nefyn). The little isolated church of St Beuno at Llanveynoe, which lies in the shadow of the Black Mountains. An idyllic spot to pass awhile for my afternoon break. The first real warm day of 2018. 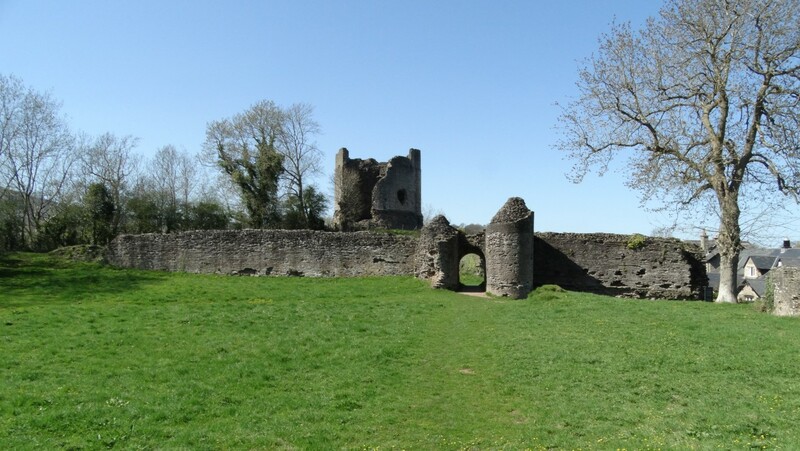 A visit to explore the ruins of Longtown Castle to complete my walk. Afterwards, I press on towards Longtown on a very gradual descending lane and finally in the village make a detour to visit Longtown Castle. The castle was built around 1175AD by Hugh de Lacy and was of an unusual construction with three baileys. In its heyday, a small town sprung up around the castle called Ewias Lacey. By the 14th century, the castle was in decline but was again pressed back into use during the Owain Glyndwr uprising in 1403. Having explored the ruins which are dominated by the circular keep it was then just a short walk back to the car to complete a perfect days walk.